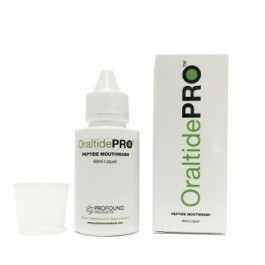 Oraltide-Pro Mouthwash with DPR (Dental Bond Peptide) AGDP (Anti-gingival Degenerate Peptide). This scientific mouthwash promotes re-growth of shrinking gums, oral healing, prevents infections (such as gingivitis) aids enamel remineralisation, while reduces bacterial growth and etching, fills slots in damaged enamel. 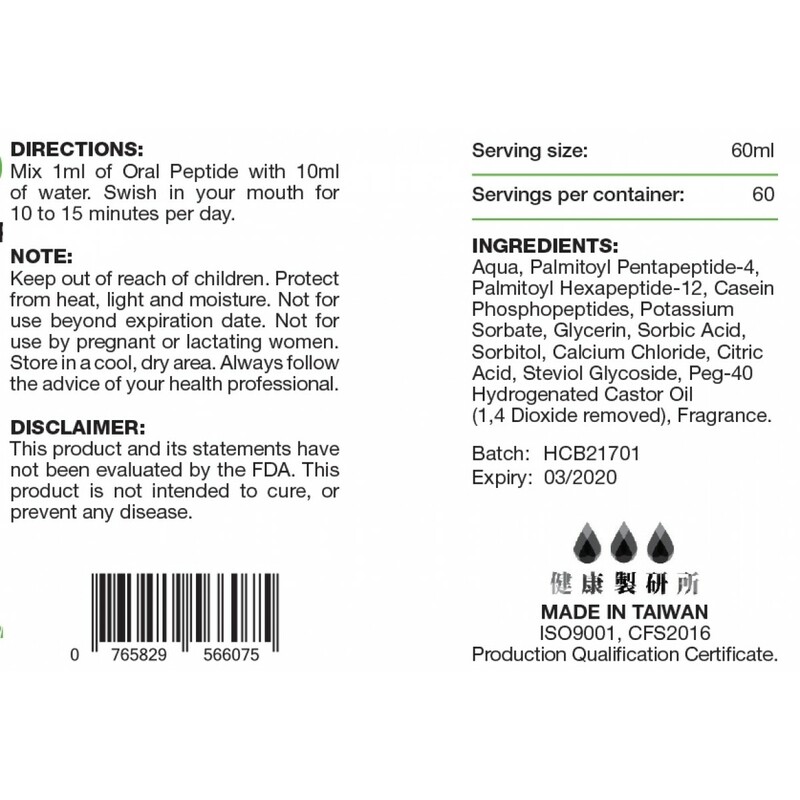 OralTide-Pro Mouthwash containing DPR (Dental Bond Peptide) and AGDP (Anti-gingival Degenerate Peptide). An elite mouthwash that unlike all the harmful toxic mouthwash availble in supermarks actually benefits your oral health and promotes healing. 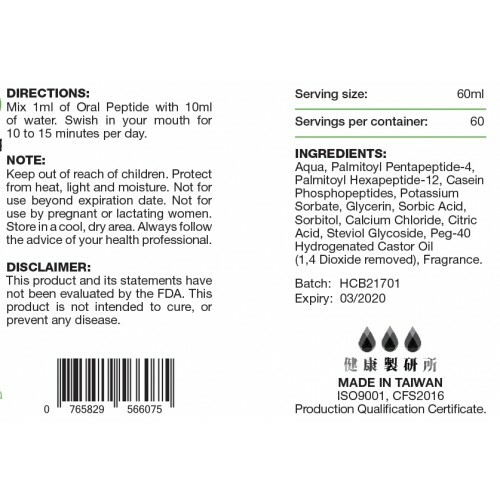 OralTide Mouthwash is FREE FROM Bactericide, Alcohol, Fluoride, Potassium Nitrate, and Artificial colours. 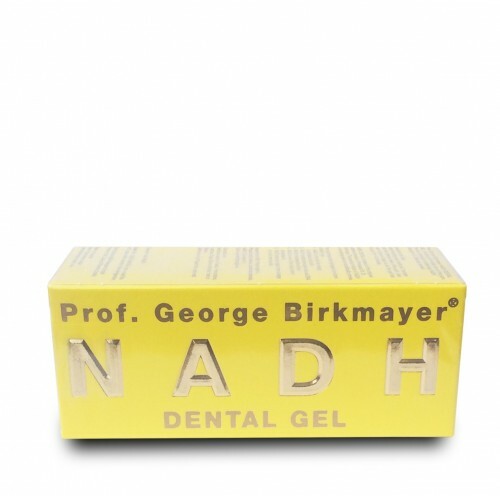 Promotes growth of shrinking gums. Speeds healing of mouth & tongue. 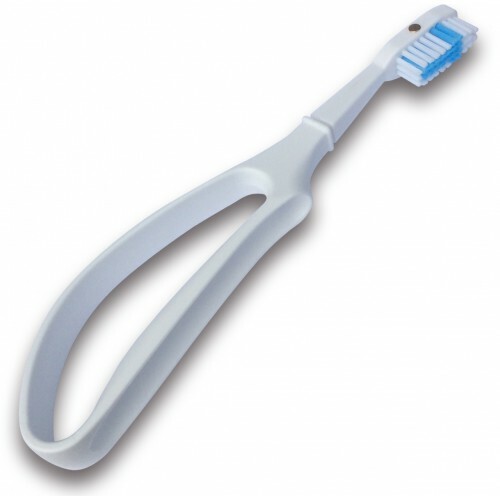 Prevents oral infections (such as gingivitis). Reduces bacteria growth and etching. Fills slots in damaged enamel. Ancient Purity are sure that CAP is a protein fragment that mimics bovine a-casein hydrolyzed decapeptide, (10 peptides). The source is from bioengineered fermentation(using endotoxin-free E. coli or edible pharmaceutical grade yeast) and does not contain any animal ingredients. See label in product images. Ethical: Ancient Purity uses peptide products which are produced by microorganism fermentation and purification, and contain no animal products. 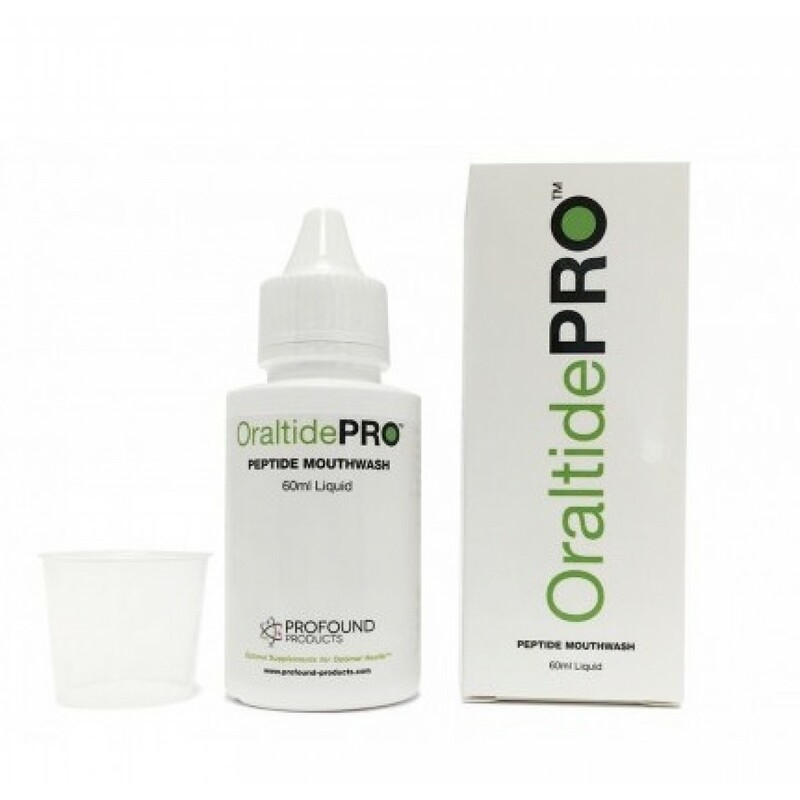 Mix 1ml of OralTide in a small amount of water. Swish around your mouth for 10-15mins. Q - Dr. Lippman in your book Stay 40 and also in issue no. 4, 2015 Aging Matters magazine you show before and after photos of individuals whom over a 12-18 month period ‘got fit’ by aerobic exercise, but showed the dramatic ageing of their faces and hair at the same time. Would you please indicate at what level aerobic exercise can become problematic? A - Heavy aerobic exercise, including heavy breathing, burns up approximately 8 times the amount of inhaled oxygen compared to oxygen consumed at rest. Unfortunately, even an athlete’s enzymatic defences can only dismutate (render harmless) 2 times the resting radical production. Consequently, without antioxidant supplementation, free radical damage occurs extensively throughout the body. This damage is visibly apparent in the hair and face of older people (as per the before-and-after photos in my article published in the Aging Matters™ magazine and in my book STAY 40). To summarize: Heavy aerobic exercise generates free radicals that burn up a body and prematurely age it. In other words, we breathe pounds of oxygen daily which converts to grams of free radicals that damage our bodies if we don’t have sufficient protection from our free radical lines of defence. Q - The ACF228 supplement contains catalase enzyme. I have been made to understand that catalase enzyme is digested instead of being absorbed by cells, rendering it potentially useless in supplement form. As far as I am aware, if you ingest a product it will go into your blood stream. After researching this on the website, I am unable to find anything that may suggest that the catalase enzyme is digested instead of absorbed. If you could clarify this for me, it would be much appreciated. 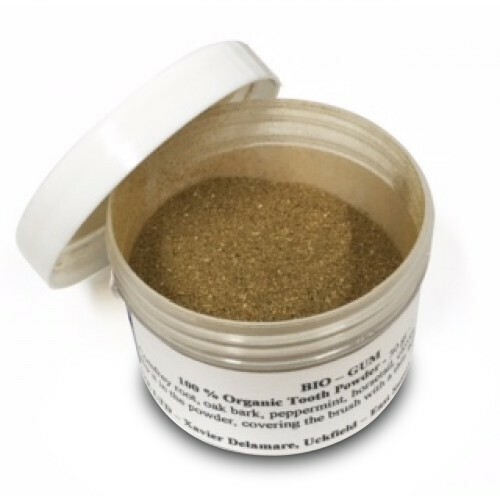 Q - I'm searching for Superoxide Dismutase - this is the product that increases SOD production as I've been searching for years for one that actually works. 99% of SOD products marketed do NOT work as SOD is sooo fragile.